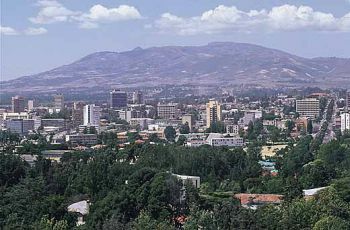 Addis Ababa was the last imperial capital of Ethiopia and serves as the capital of the modern state of Ethiopia. Addis Ababa came into existence in 1886 as a mineral springs resort for Ethiopia’s royal family and nobility. In 1892, Emperor Menilek II (r. 1889-1913) made it the capital when he constructed his palace there. By 1896, members of the nobility began to build permanent homes in the new capital. Neighborhoods bearing the names of these nobles provided housing for their followers along with districts for the imperial employees. Foreigners, artisans, and merchants also flocked to the city. The city’s previously uncertain future was established in 1907 with the granting of land charters and, in 1917 when the railroad arrived from Djibouti. By 1917, Ras Tafari Makonnen, later Haile Selassie (r. 1930-74), had become one of the most powerful people in Addis Ababa. He recognized the future importance of the city and redistributed much of his recently acquired wealth to gain the support of the emerging class of urban Ethiopians. In 1918, a series of popular demonstrations in Addis Ababa catapulted Tafari to the head of a regency council. Addis Ababa experienced an economic boom between 1926 and 1927, fueled by the lucrative processing of coffee and hides just before export. Aided by this new wealth, the bourgeoisie of the city began to construct new, stone houses filled with imported European furniture and the richest amongst them drove automobiles. At this time, a rudimentary banking system began to develop in the city. In 1930, Tafari was crowned Emperor Haile Selassie in a spectacular week-long celebration. The extravaganza was preceded by a wave of city-wide improvements including street paving, the installation of power lines and telephones, and the erection of several monuments throughout Addis Ababa. However, after a string of defeats by the Italians, who had invaded in 1935, the Emperor was forced to leave Addis Ababa and the country in 1936. This triggered a riot in the capital which was only quelled when the Italians occupied the city days later. Exactly five years later, with the assistance of a British army, Addis Ababa was liberated and Selassie reentered the city. During the next twenty years, Addis Ababa continued to modernize and attract foreign investors, traders, and Ethiopians from the countryside, and it was a center of higher education. However, the slow government response to a famine in 1973 led to first a series of student demonstrations in 1974 in Addis Ababa, and then to a successful coup d’état which disposed Selassie. The military regime, known as the Derg, fell in 1991. Addis Ababa continues to this day as Ethiopia’s capital and first city, with a population of 3.3 million in 2008. Bahru Zewde, A History of Modern Ethiopia 1855-1991 (Athens: Ohio University Press, 2001); Harold G. Marcus, A History of Ethiopia (Berkeley: University of California Press, 1994). (Berkeley: University of California Press, 1994).